CONNECTICUT ARTS CONNECTION -- An award-winning site for news and reviews of Connecticut's professional theater and arts. 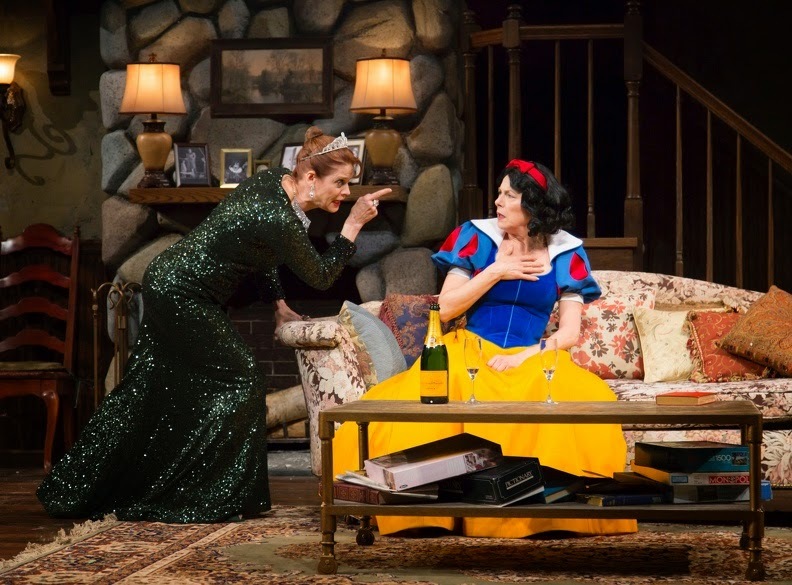 Christopher Durang's Tony Award-winning comedy Vanya and Sonia and Masha and Spike with its dark and contagious humor wraps up the 50th anniversary season at Hartford Stage. Maxwell Williams directs a talented ensemble to tell the story of three very different siblings gathering at their home, where quoting Chekhov, throwing coffee cups at the wall and channeling Maggie Smith are not considered strange. This is a very funny, tongue-in-cheek send-up of some of Chekhov's themes (the siblings, Vanya, Sonya and Masha all have been named after the playwright's characters), but Durang doesn't waste time trying to parody the classics. He just skilfully pokes smart fun at them -- and at relationships and global warming to boot. The three siblings, named by parents who apparently were too involved in community theater, have traces of The Seagull, Three Sisters, Uncle Vanya and Chekhov themes in their lives, but these folks are way funnier. Vanya (a droll Mark Nelson) and Sonia (Caryn West) live uneventful lives in their Bucks County, PA farmhouse. They gaze out at a few cherry trees, which Sonia insists is an orchard, and at the lake where a heron lands every day and wonder what their lives might have been like if they hadn't missed out by having to care for their elderly parents until their death. Their vivacious sister, Masha (Leslie Hendrix), paid the bills, but escaped to a more glamorous life as a successful Hollywood actress. To Vanya and Sonia's horror, Masha considers selling the expensive home (a combination of the interior and exterior of the house designed by Jeff Cowie.) She arrives for a visit with much younger, amazingly fit, but dimwitted actor boyfriend, Spike (David Gregory) in tow. The two share a sexual attraction, but the perfectly coiffed and attired Masha (Tricia Barsamian, costume design) worries about the age difference, especially when Spike takes an interest in Nina (a delightfully innocent Andrea Lynn Green), a nymph-like, beautiful and young wanna-be actress he meets on the beach next door. Adding more humor to the mix is Cassandra (Stacey Sargeant), the family's housekeeper who is gripped with strong clairvoyant visions, not unlike her Greek goddess namesake, urging everyone to "Beware!' -- of just about everything and anything. And as it turns out, the voodoo-practicing woman is right most of the time even if her warnings do get off track. Sargeant is very entertaining and has the audience in stitches. Kudos to Durang for a sharp, humor-filled script that has depth with regards to the Chekhov themes layered in there. Each character has a moment in the the spotlight from a "reverse striptease" by Spike to a phone conversation for Sonia with a potential love interest to a tour-de-force soliloquy by Vanya lamenting on the loss of simpler times. And all that happens woven into a plot that has Masha in a Snow White costume with the others in tow as dwarfs and the beautiful queen before she turned evil as channeled by Maggie Smith playing her role in the film "California Suite." Delightful! The pace here could use some sharpening as the two-hour-45-minute run time (with an intermission) felt long. Maxwell also compartmentalizes Vanya's powerhouse rant instead of letting Nelson deliver it in one breathless exercise in frustration. I also couldn't help think, that since West reminds us of Sigourney Weaver (who played the role on Broadway) in elegant looks and demeanor and since Hendrix takes Masha to a maniacal level more in character with Sonia's persona, the play might have gone to another level by switching the roles. Join members of the cast and the artistic staff for a free discussion, immediately following select 7:30 pm performances on Tuesday or 2 pm Wednesday matinees. ADDITIONAL REVIEWS at American Theater Web. Type the name of the show in the search tab. All contents are copyrighted © Lauren Yarger 2009-2016. All rights reserved. Lauren Yarger is a theater reviewer in New York and Connecticut. She is former Second Vice President of the Drama Desk and a voting member of the Drama Desk and of The Outer Critics Circle, for which she serves as Event Manager for the annual awards dinner. 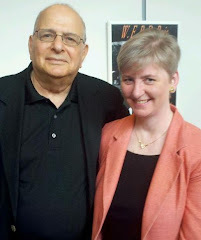 She is a member of the American Theatre Critics Association, the Connecticut Critics Circle and is a member of the League of Professional Theatre Women, serving as Founder of its Connecticut Chapter. Theater Center in Waterford, CT.
She is a Contributing Editor for BroadwayWorld.com. for CurtainUp.com . She was a Connecticut and New York reviewer for American Theater Web. Yarger is a book reviewer and writer for Publishers Weekly and freelances for other sites. She is a member of the National Book Critics Circle. by the Society of Professional Journalists. She also served as a member of the Connecticut Critics Circle awards committee. the Hartford Symphony Orchestra and served for nine years as the Executive Director of Masterwork Productions, Inc. She lives with her husband in West Granby, CT. They have two adult children.